Whenever you enter a bar, the first person you notice is the bartender. Why? 1. You came to the bar for drinks, and they’re serving you. 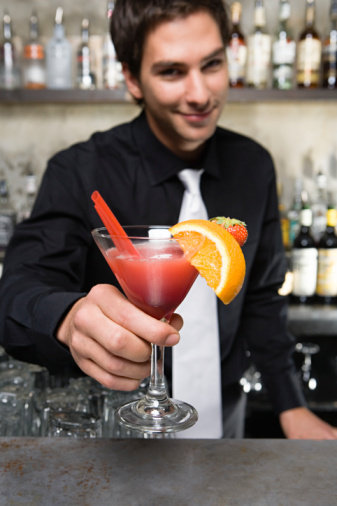 It’s in a bar’s best interest to hire someone attractive, charming, and easy to speak with. A bartender doesn’t just serve you drinks, but they make it comfortable for you to stay around and spend more of your money. They are the marketer, the entertainment, and holder of all alcohol. They can cut you off or serve you more. If you are attractive, it is in their best interest to keep you around. This usually works by serving you free drinks, and keeping you happy. BUT, here’s the thing. Don’t get attached, because it’s just an act. As a bartender in a prior life (aka 2 years ago), I watched during my brief stunt the mechanics of the act of a bartender. They might call you sugar, sweetheart, wink at you from behind the bar, or “accidently” leave a few drinks off the bill. They might strike up a conversation and become your best friend. This ultimately is to make sure you hand over a 20%+ tip, and to make sure you come back. I have a friend that bartends at a local bar in my neighborhood. He used to text me to “come say hi”. Once in a while, I would watch girls flaunt themselves at him. The most inventive way I’ve seen a girl slip him her number was by writing it on a napkin and putting it alongside the signed copy of the bill. Half the time, he would smile and kiss her cheek, while casually balling up the napkin barside and tossing it into the garbage. The other half of the time would go into the abyss of the cell phone black book. ….while he had a girlfriend. I’ll be honest with you, I’ve crushed on my share of bartenders. The first time I moved to NYC, I met a bartender that gave me free drinks, asked me about my internship on Friday Happy Hours, and ended up kissing me on the bar during a duo karaoke rendition of “Summer Nights”. He asked for my number, we went on a date, couldn’t get into my pants, and I never heard from him again. In the world of a bartender, a “thumbs down, pants kept up” meant that I was quality to his want to quantity. A year later I met a boy on the dance floor who coincidentally was a bartender on his day off. Our dates went from hangouts to me hanging at his bar. Soon, Prince Charming was just Mr. Charming, and I not much more than an adorable (obviously) customer at the bar. I walked away. So, next time you think about giving your digits to the “special someone” behind the bar, I say run. Unless your life is similar to the life of a bartender, and you’re incredibly secure in your relationship, it’s a hard life path to work with. They work night to early morning, while most of us are hitting snooze at 7am before our 9-5pm work weeks. They get hit on repeatedly, most of them work weekends, and alcohol is a constant factor in their lives. Whether male or female, their main prerogative is to work their job, and the best of them charm their way into your wallets. SO buy your overpriced alcoholic (or not) beverage of choice, smile politely, tip appropriately, and GTFO of the bar stool zone. Let the newly legal to drink lushes wink their way to a free lemondrop shot, and reminisce about your days as “that”. Cheers to you, you’ve come so far.